Making chunk candles is a fun activity for all ages. 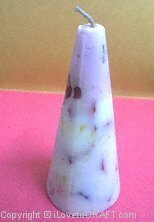 A unique technique using wax chunks of different colors gives the finished candle a beautiful texture and look. They make a refreshing alternative to the usual pillar candles. Follow these step-by-instructions and make your own pretty chunk candles as homemade gifts. Note: You can make different types of candles by altering the number of colors and chunks used. You can choose all your chunks to be of the same color or different colors. The color of the ‘filler wax’ can also be white or any other color that you choose to have.